There are still tickets available for a fascinating discussion about the Wansdyke ancient monument on March 22 at Bath Royal Literary and Scientific Institution (BRLSI). 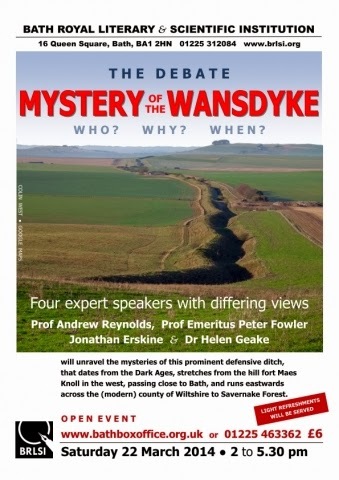 Four expert speakers with differing views - Prof Andrew Reynolds, Prof Emeritus Peter Fowler, Jonathan Erskine and Dr Helen Geake - will unravel the mysteries of this prominent defensive ditch. The Wansdyke dates from the Dark Ages, stretches from the hill fort Maes Knoll in the west and runs eastwards across the (modern) county of Wiltshire to Savernake Forest. The Wansdyke also runs along the southern edge of Bath, between the city and South Stoke village. Those of you supporting our campaign to save South Stoke Plateau from a 300-home development will know that the Wansdyke (a Scheduled Ancient Monument) passes along the northern edge of the Plateau.